We just flew back from Arizona, and boy, are our arms tired — because we handed out thousands of fliers, posted thousands of posters and talked to hundreds of students about the ERA and the chance to ratify it in their state come January! It was a massive effort. 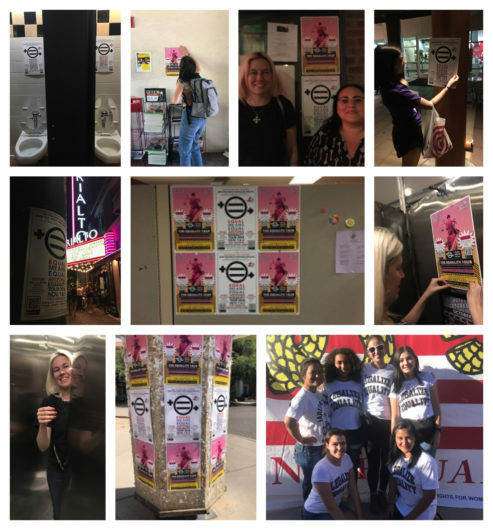 We mobilized 100 volunteers and put up 3500 posters on 9 campuses across the state and in the downtown areas of cities near the universities. EQUAL MEANS EQUAL thanks Carmen Linero-Lopez from Feminist Majority Campus, Jami Parrish and Bonnie Aaronson from Tucson NOW, Dianne Post from ERA Task Force AZ and student organizers Lauren Brown & Ayesha Ahsan for their hard work. 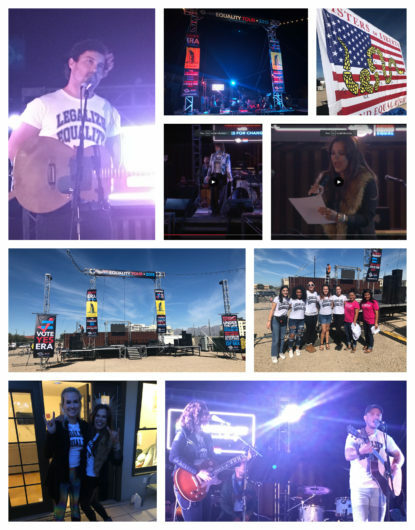 EQUAL MEANS EQUAL also hosted two big concerts (Thursday November 1st in Tucson and Saturday November 3rd in Tempe) to help get out the student vote. 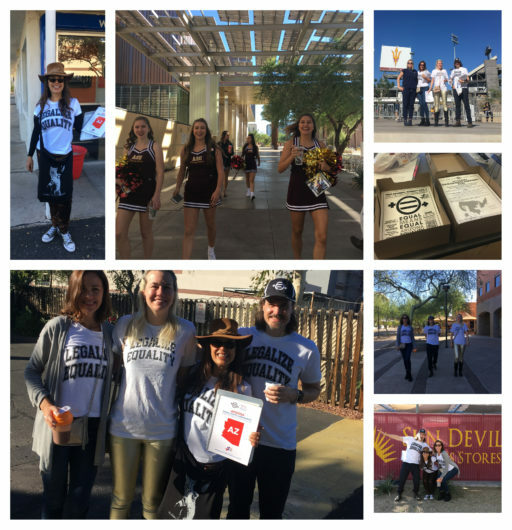 EME Team members Natalie White, Joel Marshall, Kim Starzyk & Melinda Reichenbach went down to the ASU football game to invite people to the concert and gave out a thousand fliers with the names of the pro-ERA candidates that signed the EME Equality Pledge while they were at it. Lauren Brown, Natalie White and Daniela Siqueiros help paper the Tucson area with our message! Bottom right, the volunteer team lines up in front of Natalie White’s Sisters of Liberty banner before the show at the Tucson fairgrounds begins. We live streamed the concerts out on Facebook and from our website and had hundreds of people viewing the show from all over the world. 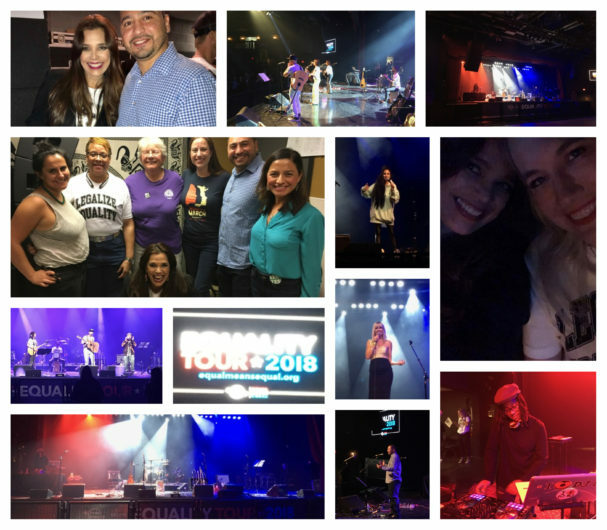 Special Thanks to Rebecca Galvez for holding down the fort in L.A. and making it possible for the EME Team and all the performers to get to Arizona and make these concerts happen!